This is what I asked my husband when we were in a very special place. 25 years ago we visited St Petersburg to visit our daughter who was at university there. We had a marvellous time…..Maxine took us to the Hermitage, the St Petersburg Jazz Club, the Philarmonic Hall and last, but not least, the Kirov Theatre, previously called the Maryinski. It was the first time we had been to see a ballet and it was such an unforgettable experience. We sat in a box just below what had been the Tzar’s box. We were handed pearlised opera glasses and, incredibly, did not pay a deposit! The intermission was so civilised with tiny little bars dotted around selling champagne and caviar. Giselle was a beautiful ballet and I will never forget the Willies gliding across the stage like beautiful dolls. I don’t think anything else will ever have the same effect on me, and that is why I asked if beauty can make you cry. 25 years later, I still love ballet and have managed to combine it with my creative side. 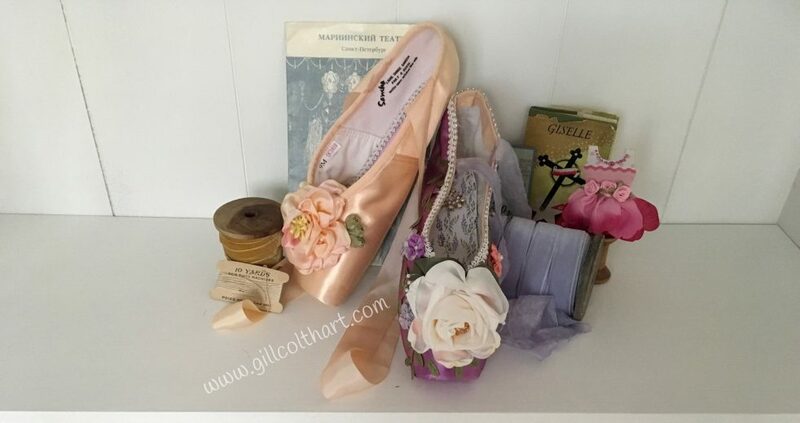 I love to decorate pointe shoes in my own style; I buy pure silk ribbon, dye it and sew roses. Each rose is unique with different colours and shape. Adding braid, ribbon, rhinestones and pieces of vintage jewellery adds to the look.